WHO is collaborating with the World Confederation for Physical Therapy (WCPT) and the World Federation of Occupational Therapists (WFOT) to strengthen rehabilitation in Tajikistan. 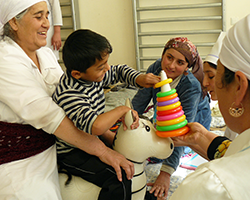 Currently, there are over 180 000 registered children and adults with disabilities in Tajikistan. People with disabilities, older people and people with noncommunicable diseases (NCDs) make up the largest groups in need of rehabilitation services; NCDs have increased 18% in the last decade and are now the leading cause of death and disability in Tajikistan. To address this shift in health-care needs, more trained rehabilitation professionals are needed – especially physical therapists, occupational therapists, and prosthetists and orthotists, as the country currently has no formally educated professionals in these fields. In the summer months of 2018, the WHO Country Office in Tajikistan welcomed representatives of the WCPT and WFOT to Dushanbe to facilitate collaboration with the Ministry of Health and Social Protection on improving capacity-building and education for rehabilitation professionals. The visits were in consonance with the action plan of Tajikistan’s National Programme on Rehabilitation of Persons with Disabilities (2017–2020), which aims to create a health system that is accessible to everyone and is staffed with well trained health-care professionals. WHO has been in official relationship with the WCPT since 1951 and the WFOT since 1959. This is the first time the partnerships have been leveraged to make a country-level impact by improving education to establish the professions in Tajikistan. Each visit lasted for 1 week and included meetings with Ministry representatives and other stakeholders. Participants visited various rehabilitation hospitals in Dushanbe as well as the Republican Medical College, where plans are progressing to include curriculum for a bachelor’s programme in physical therapy and occupational therapy. Additional projects, such as a train-the-trainer programme, internship opportunities for students and postgraduate education, are also being explored. Strengthening occupational therapy and physical therapy education in Tajikistan will lead to a necessary increase in human resources and capacity, and ensure that those requiring rehabilitation services will have access to appropriately trained health-care professionals. This action was the first step in the collaboration between WHO, the WCPT, the WFOT and the Ministry to strengthen these professions in Tajikistan. The alliance will provide technical assistance that will help the Ministry meet its commitment to provide rehabilitation services to people with disabilities, older people and people with NCDs, and promote universal health coverage. These commitments are in alignment with the United Nations Convention on the Rights of Persons with Disabilities, which Tajikistan signed in March 2018. Tajikistan’s National Programme on Rehabilitation of Persons with Disabilities (2017–2020) is implemented by the Ministry of Health and Social Protection with technical support from WHO and financial support from the United States Agency for International Development (USAID).